The second television anime adaptation of the popular detective series premieres this Monday. Terrestrial broadcaster GMA Network has announced in a television advertisement on Sunday that The File of Young Kindaichi R is set to air on the channel’s “Astig Authority” anime block starting next week. The anime will premiere on May 21, airing Every Monday to Friday mornings at 08:25pm, replacing Assassination Classroom. The File of Young Kindaichi R is the fifth anime adaptation of the long-running mystery manga series by Yozaburo Kanari and Seimaru Amagi, with illustrations by Fumiya Sato. The manga started its serialization on Kodansha’s Weekly Shonen Magazine in 1992, which ran until last year, and moved to its sister publication Evening magazine starting this year. The manga series currently has 76 volumes. Yutaka Tsuchida, who directed the anime movie Eiga Precure All Stars: Minna de Utau Kiseki no Maho!, directed the anime adaptation and written by the team composed of Atsuhiro Tomioka, Miyuki Kishimoto, Takuya Matsumoto and Yoshifumi Fukushima. Character designs are made by Akihiro Asanuma, which was produced by Toei Animation. Southeast Asian anime channel ANIMAX Asia has aired The File of Young Kindaichi in September 2014, while the second anime series premiered in March 2016. 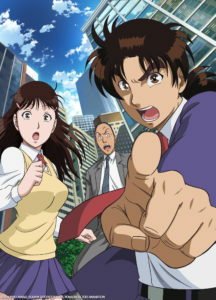 The terrestrial broadcaster has not aired the original 1997 anime series, but they have aired The File of Young Kindaichi: Lost in Kowloon, the 2013 television special of the popular detective series starring Ryosuke Yamada as “Hajime Kindaichi”, which was aired in January 2015.